As early as October 20, 1914 the Manifesto signed by Russian Emperor Nikolai II stated that Ottoman entry into World War I would “result in fatal consequences and open way for Russia to fulfill her for-fathers’ missions on Black Sea Rim” After a series of Russian triumphal battles at the Caucasus front in 1915, the Imperial Government took diplomatic steps towards securing future conquests in the area. For that purpose, Russian emissary Dr. Zavriev was sent to Paris and London in mid-April, 1915, to discuss Russian proposals with the Foreign Ministers of the Allies. In Paris Dr. Zavriev was joined and supported by Poghos Noubar-Pasa who represented Western Armenians. 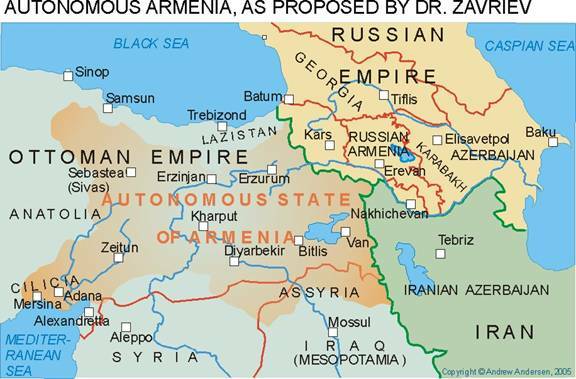 According to proposals delivered by Zavriev and Noubar-Pasa to British Foreign Office, an “Autonomous State of Armenia” was to be established in Eastern Turkey after the Allied victory. The proposed Armenian state under formal Ottoman suzerainty and Russian protectorate, was to embrace not only the six vilayats forming “Turkish Armenia” but also part of Cilicia with the provincial capital of Adana and Mediterranean port of Mersina and a wide corridor that included Zeitun –Urfa area of the vilayat of Aleppo (Khaleb). The British and French did not seem to be quite enthusiastic about the idea of autonomous Armenia under Russian protectorate stretching from Aras to Cilici. According to the letter written weeks later by British diplomat Sir Mark Sykes to Sir George Buchanan serving as an Ambassador to Russia, an autonomous pro-Russian Armenia in the borders specified by Zavriev, was unacceptable in terms of British interests because that kind of autonomy could result in her secession from the Ottoman Empire either as a part of Russia, or as a fully sovereign state. The first scenario of that Armenian project could result in Russia’s direct access to Mediterranean Sea and thus quite disproportional increasing of her influence in the Middle East while the second one according to Sykes, lead to the creation of “another Bulgaria” that could fall under German influence. 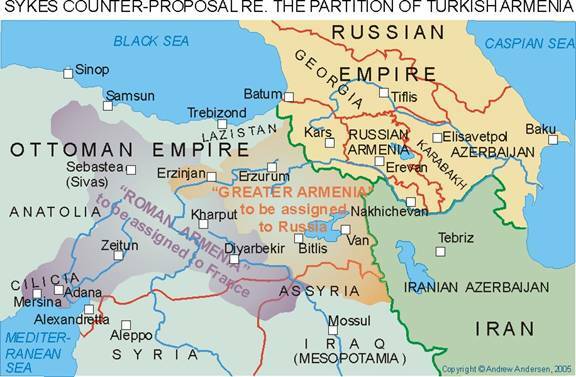 An alternative proposal worked out by Sykes and his French colleague François Georges-Picot, provided for the partition of Turkish Armenia between Russia and France. As per Sykes-Picot plan, Russia was to acquire the Straits and only three easternmost “Armenian” vilayats of Erzerum, Bitlis and Van. 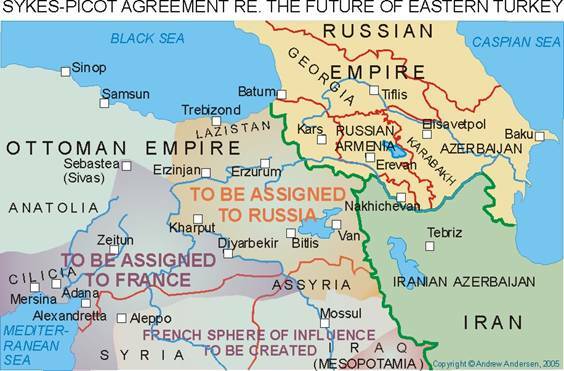 The remaining part of Zavriev-proposed Armenia defined by Sykes-Picot as “Roman Armenia” was to be put under French sovereignty. The Sykes-Picot offer completely dissatisfied the Russians. Based on correspondence between Russian Minister of Foreign Affairs Sergei Sazonov and Emperor Nikolai II in the aftermath of the receipt of the first Sykes-Picot counter-proposal, the border with a European democracy seemed to be much less acceptable for the Imperial Russia than a border “with an Arab Khaliphate or a Turkish Sultanate”. The secret negotiations and debates between Russia, Britain and France regarding the details of the future partition of the “Ottoman heritage” continued until May, 1916, when a delimitation agreement was finally accepted and signed by all the involved parties. World War I operations and battles in the South Caucasus, Eastern Turkey and Northern Iran were accompanied with violence against civil population from the very beginning. In late 1914, following Russian tactical retreat from Keprikey, Tutak and several villages of Iranian Azerbaijan, the Ottoman and pro-Ottoman troops crushed upon local Armenian and Assyro-Chaldean population. As an avenge for the reported collaboration with the Russians whom they really greeted as fellow-Christians, many Armenians, Aysors and Yezids were thrown out of their homes, beaten up, robbed and occasionally killed. However, it was in late April of 1915, when Turkish law-enforcement, military and paramilitary units launched systematic repressions against ethnic Armenians all over the empire aimed at complete de-Armenization of Asia Minor. From 1915 and until now, historians, politicians and journalists have been writing and speaking on what happened to Armenians and other Christian subjects of the Ottoman Empire in 1915-1918, and so far no consensus has been reached. What some writers and speakers define as genocide and holocaust, is referred to as a collateral damage of the war by the others. 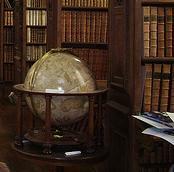 We are unable to provide a comprehensive analysis of those tragic events within the framework of this short essay. Neither are we in a position to address their moral aspects. However, we have to confirm that according to numerous sources, there were up to 1.5 million Armenians residing in Eastern vilyats of Ottoman Turkey at the beginning of 1914, who almost completely vanished from the area through either death or deportation by the end of 1918. Izvestija Ministerstva Inostrannykh Del, Vol V (Petrograd, 1914), p. 216. Justin McCarthy, Muslims and Minorities (New York, 1983), p. 110.